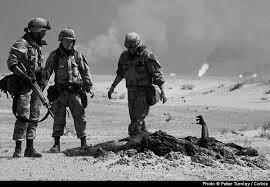 Gulf War research papers can examine the war from any aspect you need. The historical significance of the Gulf War or the political complexity of the situation may be covered along with what it meant to the United States at the time and now. In your research paper on the Gulf War, you may want to begin by stating that on August 2, 1990, 100,000 troops from the armed forces of Iraq invaded Kuwait. The dispute originated from Iraq’s contention that Kuwait was overproducing oil for export, causing the price of a barrel of oil to plummet from $20.50 to $13.60 in the space of a few months. Iraq invaded Kuwait, quickly overwhelmed the tiny nation and began looting the vast Kuwaiti riches. On August 7, President Bush ordered a massive US military build up in the Gulf region to deter further Iraqi aggression. This operation was given the code name Desert Shield. Eventually, thirty other nations joined in a coalition of armed forces in the Persian Gulf, committing troops, combat aircraft or warships to the effort. During the first week of November 1990, President Bush and his cabinet advisors decided to turn Desert Shield into an offensive. Further troops and material were ordered to the area, and by January 16, 1991, US troops strength in Saudi Arabia was listed as 425,000. That night, the air campaign of Desert Storm began. What follows is not a chronological history of the Persian Gulf War. Rather it is a Gulf War examination of the military strategy and tactics employed by the United States against Iraq. These maneuvers can also be seen in light of two of the most influential treatise on war: Sun Tzu’s On The Art of War and Carl von Clausewitz’s On War. Sun Tzu’s work comes from the 6th century BC; von Clausewitz’s book was first published in 1832. Both of these works continued to be studied today, proving that they contain key lessons in fighting and winning a war. Culture in Saudi Arabia - Culture in Saudi Arabia research papers delve into Sharia Law and why family values are the most important part of education. Religion of Saudi Arabia - Religion of Saudi Arabia research papers explore what they think is sacred and to them it was God. Government of Saudi Arabia - Government of Saudi Arabia Research Papers discuss different councils the government runs. Why Muslims Hate America - A great research paper topic these days is exploring why Muslims hate America. Saddam Hussein's Leadership - Order a custom research paper or research paper on the leadership of Saddam. Colin Powell - Colin Powell research papers on one of the most honorable, responsibility driven individuals of a political position in the United States. Al-Qaeda History - Al-Qaeda's first meeting was held on August 11, 1988. Its founder was bin Laden. During the Gulf War bin Laden offered King Fahd of Saudi Arabia his services. Kurdish People - For many people in the West, their first real knowledge of the Kurds occurred a decade ago, in the immediate aftermath of the Persian Gulf War. Afghanistan Troop Withdrawal Plan - On Afghanistan Troop Withdrawal Plan Research Papers discuss how on June 23, 2011, President Barack Obama addressed the nation. Palestinian Intifada - Palestinian Intifada research papers discuss the uprising against Israeli occupation in the Gaza Strip and West Bank, and the media coverage. Iran and the Cold War - The Cold War had a distinct impact on the social and political development of Iran however not to the degree that it effected its economic position. Bush Tax Cuts - Bush Tax Cuts Research Papers discuss both the Republican and the Democrat view of the tax cuts that were passed in 2001 and expired in 2010. Case Study of Khafji Joint Operations - A Case Study of Khafji Joint Operations research paper discusses the effect of change in management on existing joint operations. Paper Masters writes custom research papers on Gulf War and write on the Iraq and Kuwait and President Bush's US military build-up.